Laser oscillators, barely discovered a decade ago [1, 2] (*), can now be modulated by the use of Kerr or Póckels cells [3, 4] to yield stroboscopic light pulses of only several nanoseconds in half-width at a frequency of an order of a megacycle per second . 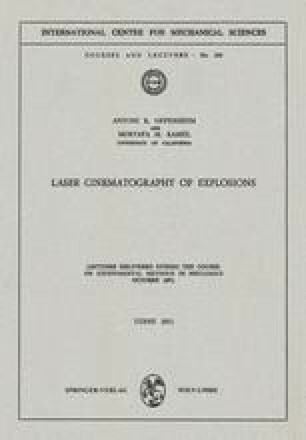 Such a light source can be used in conjunction with a rotating-mirror camera combined with schlieren optics [6, 7], a method that utilizes the fact that light is refracted by density gradients [8, 9], to obtain cinematographic records of explosion phenomena. The salient features of the apparatus are discribed in Fig. 1.1. The plane polarized light rays from the laser are expanded by a condenser lens and converted into an approximately 50 cm diameter beam of parallel light by means of the first schlieren lens or mirror. When the light beam passes through the test section, it is refracted by the density gradients associated with the gasdynamic flow field.